This month we’re celebrating Native American Heritage Month with a beautiful Navajo sand art activity and Native American corn husk dolls. Note: This post contains affiliate links if you click on it, and make a purchase I will receive a small monetary compensation. Thanks! Little one and I read this wonderful book called Many Nations: An Alphabet of Native America we loved the images of native tribes, and what each letter stood for. For example, “B is for Blackfeet riders following buffalo herds.” It’s a simple, yet very enlightening book about the native culture, and way of life. For the corn husk dolls I referenced A Kid’s Guide to Latino History: More than 50 Activities (A Kid’s Guide series). It is said that during the California Missions the settlers were taught how to make corn husk dolls from the natives, and I was thrilled to reinforce this information with All Done Monkey’s post on Exploring the California Missions. 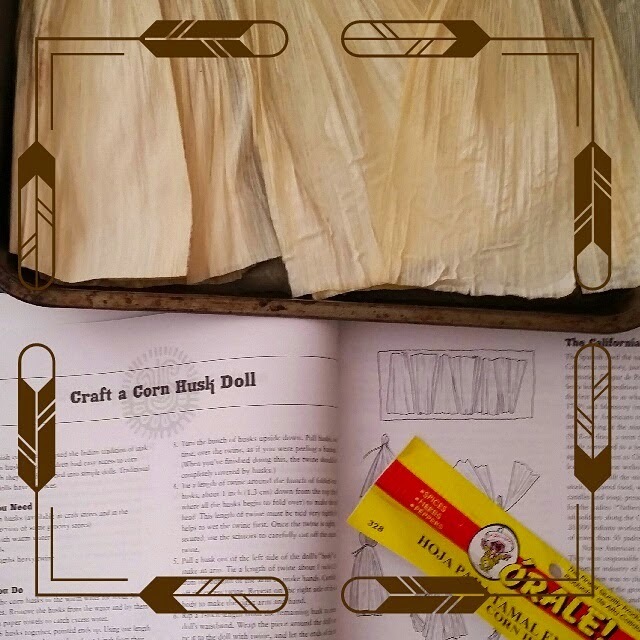 For the this activity I purchased corn husk at our local grocery store in the ethnic aisle (you can also find them in craft stores). I set aside 10-12 husks in water for at least 30 minutes, and then left them on a towel to drain. After they had been soaked, and drained I used raffia to tie them up since we didn’t have any type of twine. You tie 6-7 corn husks at the top, and then fold over to make the head. Then you pull up the sides to make the arms, and the bottoms to make legs. Tie with the raffia, and then cut off any excess. I mus t admit they came out splendid! Little one had seen an episode on Curious George where George visits a Navajo Tribe, and learns how to make sand art. Of course, my child has been asking me for months to make this so we ventured on trying it out this weekend. My child insisted that we use fruits and vegetables to color the sand like the Navajo tribe did, but I told him absolutely not! 🙂 Can you imagine squeezing beets to get some color? I don’t have the time or patience. So we went with some good old fashion food coloring (close enough to food right? ), and hand sanitizer. This process works well with pasta, and rice so I wasn’t sure if it would work for the sand. I searched the web, and many places suggested “dry tempera paint” but we didn’t have any. 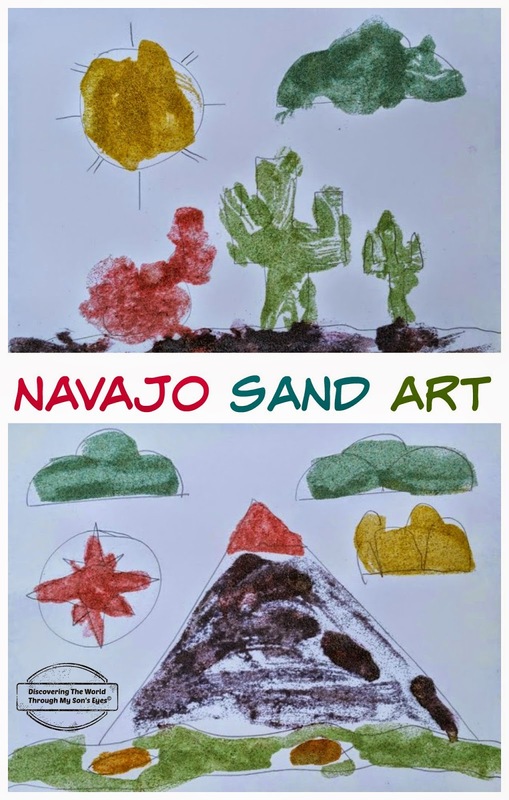 Ingredients to make the Navajo sand art: Sand (we had some from Puerto Rico, of course! ), food coloring, hand sanitizer, watered down glue, paint brushes, and card stock paper. We squirted a few drops of sanitizer into the ziploc bags with sand then dropped the food coloring, and little one rub it together. We then spread it out on cookie sheets, and popped in the oven at 225 degrees for 30 minutes so it can dry up. Then we got started, and although little one had his paper on a tray it was messy! 🙂 I drew a few templates for him to use, and he brushed on the watered down glue, and sprinkled colored sand over it. They came out pretty nice! 🙂 I really love the owl! Before you check out the Native American Heritage Month giveaway I want to share with you an interesting fact on the pumpkins that we saw at the pumpkin patch this past month. We were so excited to find out that these pumpkins were grown on a Navajo Indian Reservation in New Mexico, and were brought to our neck of the woods in an 18-wheeler across the U.S.. Isn’t that amazing! If you’re looking to learn more about Native Americans don’t forget to stop and read about the Native Caribbean Taínos from Puerto Rico. What fun activities!! My daughter would love to make both of them. Please come share at Sharing Saturday this week!! Both of these activities look like so much fun! My boys saw that Curious George episode too, so we might have to try this now that you've tested it out for me! 😉 I am adding that Latino History book to my cart, it looks awesome!